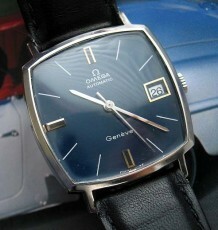 Full sized Omega automatic from 1979. 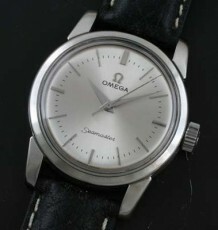 One of the full sized Omega watches that makes it very wearable. Gold filled case. 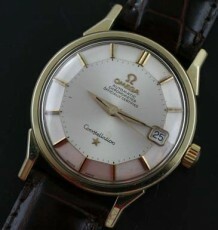 One of the full sized vintage Omega watches from the period during the 1970’s. This watch features a champagne coloured dial with gold stick markers with onyx inlays, along with black hands that have luminous inlays. This produces wonderful contrast making it very easy to read the read the time. The dial has some minor patina that does not distract from the vintage appeal of the watch. 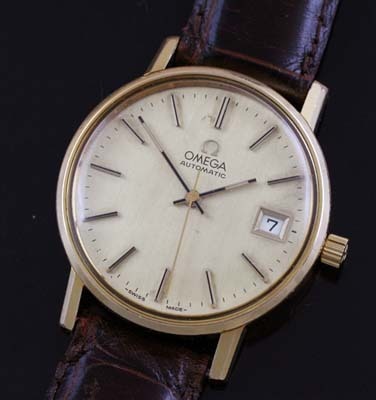 The 17 jewel Omega automatic calibre 1010 used in the watch is the same model used in the legendary Omega PloProf diving watch. The movement was just cleaned during a recent service which included replacement of the crown and crystal with genuine Omega replacements. The watch carries a reference number of 166.0202 and measures 34.5 mm wide by 42 mm long. 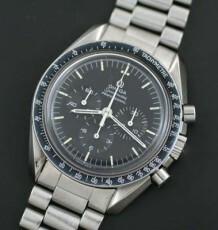 The serial number of the movement dates the watch to 1979.